What if you have Fussy toddler during mealtimes? Just now while having dinner at IMM, I noticed a family nearby our table with a toddler of about 1.5-2 years old, his daddy and mummy, and their helper. And I was shocked because they were trying to force feed the poor boy with porridge! I turned to look at first because I heard the boy crying. And at first glance I saw the mummy holding him, with him wailing and throwing his head backwards and the helper took the chance to stuff a spoonful of porridge into his mouth. He choked of course and regurgitated that whole spoonful out and of course got a scolding. The mum then carried the boy away probably to soothe him. While the helper stayed behind to prepare more porridge. When they came back, they tried to stuff porridge into the boy’s mouth again. I really wanted to go up to tell them this is not the way to feed their toddler. I didn’t have the guts to as the mum and helper both seem really frustrated. And the dad appeared nonchalant while finishing up his dinner. What they probably do not know and I hope someone tells them one day is that they are just going to make the poor child dread meal times and dreading mealtimes will not make feeding them any easier. My toddler used to not like to eat. I almost wanted to force him to eat and came across an article that told me otherwise. I will share what I have learnt and tried. In their first year of growth, they have a very good appetite. Mine used to finish 2 bowls of porridge from 8m to 12m. After 1, their growth slows down. And sometimes the intake of food lessens. Sometimes it lessens a lot. It may appear that they are choosing food to eat, but it is usually not so. It is simply that they are not hungry. Why are they not hungry? Their bodies are growing slower as compared to just a few months ago and they require less nutrients from food. So yes we can try to encourage them to eat. But there is no need to force them to do so. Sometimes a bottle of milk in the evening is sufficient for them. So how did I try to encourage my toddler to eat during the period where his growth slowed A LOT? Mealtimes became challenging. I would try all sorts of ways to feed. But when all else fails, I have learnt to just leave him be. 2. Let them self feed. Yes it will be messy. 3. Have your meals together with them. 4. Keep them entertained. With a toy or book or drawing materials. 5. Turn the spoon into a zooming aeroplane that flies into the mouth or a fish swimming into their mouth. If all these fail, don’t fret. Move on to soup or fruits. And if they still do not want, just give that bottle of milk before they go to bed. My aunty used to take it to heart that the toddler does not like her cooking. But it is really not true. There are good days when he eats and finishes all his food. When my children were younger, there were times when mealtimes were challenging, so we decided to stop if they refused to eat. They would become very cooperative when they were hungry! oh I have a BOY that LOVES FOOD! He eats everything and anything. What a breeze to feed. Then I have that GIRL that HATES FOOD. She’s so small for a 18 month old, people thought she is 12 months of age. I have a lot of trouble feeding her but I let it be. Sometimes she goes through a day without solids and well, she gets filled up from suckling. She doesn’t take a bottle until this day and only full on breastmilk. She don’t even take breastmilk from the bottle! So what do I do? I really don’t know. My mil force feed her when we visit; but not to the extend of this boy you mentioned la. haha Oh well! Good Luck to fussy eaters! There was a period of time when Lil Pumpkin was such a fussy eater and didn’t eat much too. It frustrated me a lot and actually had me worrying because before that she had such good appetite!! But yes, it is important to read up and arm yourself with knowledge so that you know when such periods are normal and how to deal with them, and when there really is an eating problem with the kid and professional help is needed. I remember the days when my boy used to go on hunger strikes and I felt like feeding him and then realized no point force feeding. So when i got a girl, i let her eat everything on her own so that she loves the food and its texture. I have noticed that she is more open to explore and eat food. I have a fussy eater at home still even though he is 6 already. When he was a toddler, he went straight from cereal to rice. He refused all porridge and just wanted rice… we had to crack our heads because he had no teeth and couldn’t deal with a lot of the food. He is still choosy and will eat a lot of what he is familiar with but will refuse anything he doesn’t like or has not tried. I’m still waiting for the day when he will open up to other food other than his familiar favourites. Maybe a mis-step on my part but he was so strong willed there was no way I cld even attempt force feeding. For fussy eaters, perhaps they may prefer food that are of softer texture or easier to swallow. Would using prettier utencils help entice them? Oh yes! It is very true! 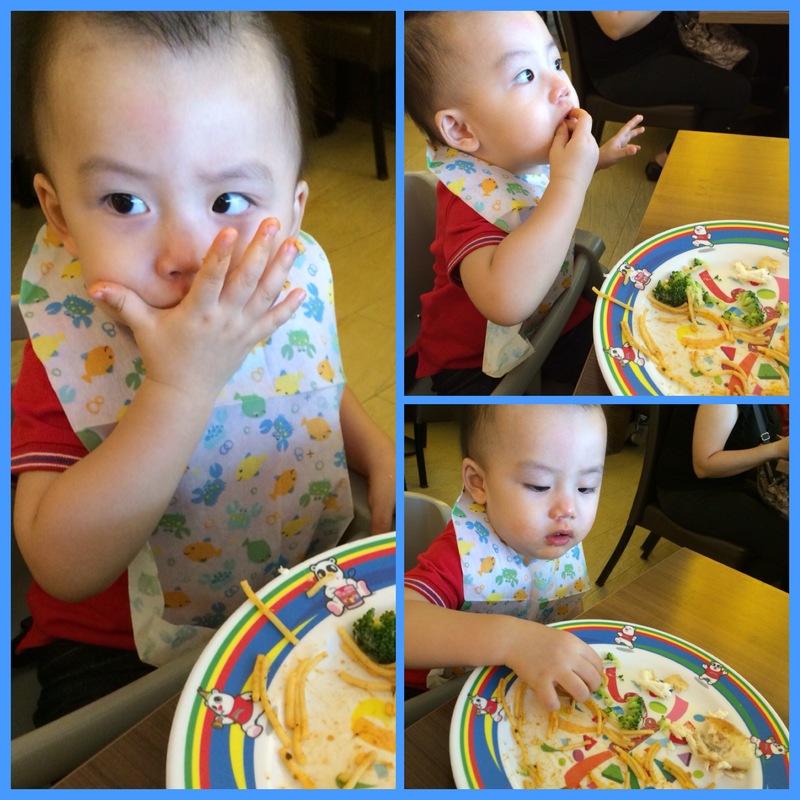 For my son, he was a MEGA eater when he was 1 to 2 years old. And then when he turned 3, his appetite slowed down to a crawl and sometimes, he struggles to finish a bowl of rice. I have a fussy eater in my younger child who will eat what she likes and after a few “battles” with her, I decided that I was not going to win. We went with what she WILL eat. I am also very conscious NOT to make food a battle. She eats well. Just not the food that I will sometimes like her to have, for example more fruits other than just apples she hates rice, so we substitute this carbo with noodles, potatoes or pizza.